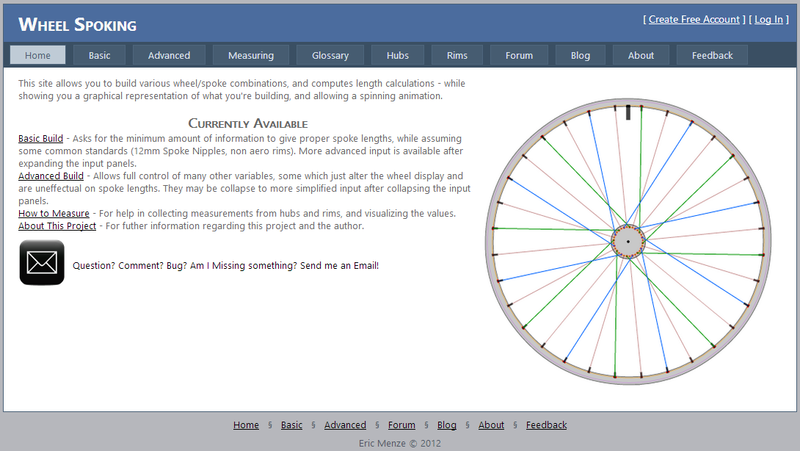 Wheel Building Made Easy » This site assists wheelbuilders accurately size their spokes in various configurations. 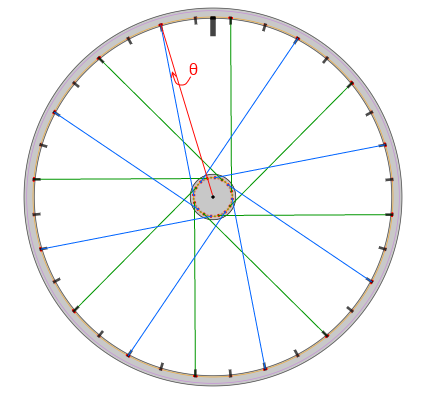 I got an email from a user who was confused about what the spoke angle measurements were, and while I was looking into it I found and corrected an error in the measurements (it happened when the spokes rotated all the way around the hub, something that would never be laced in the real world). Spoke Angles perpendicular to Rim - Imagine a radial spoke being 0 degrees (you can see this number go to zero if you select Radial). This measurement is how ‘off Radial’ the spoke is, while looking at the side of the wheel like in the display on the page. Spoke Angles toward Axle - This would be the angle if you were to look at the wheel edge on, imagining a line from the spoke eyelet straight across the rim, and will increase as the hub gets wider, and decrease as the hub gets thinner. The only way this would be zero is if the wheel were laced in such a way that the hub flange were perfectly in the middle of the rim, which doesn’t happen with spokes (though in theory, Spin wheels would have a zero degree angle here). Welcome to the brand new WheelSpoking.com Blog! I started this project in February of 2012 when building my first set of wheels. I had rims with an alternating offset (so the spokes would be shorter by a small amount), I was considering lacing the spokes all on the outside of the hubs (which would lengthen them), and had Bullseye hubs that I needed to measure myself. The best tools to even come close were two web apps both based on an excel spreadsheet (here), and a basic calculator (here). However, they didn’t get very accurate or allow for detailed entry such as alternating or offset seats and the other fine tuning I wanted to do. As I started to get deeper into this, I used an HTML5 canvas tag to draw the wheel, size it to scale, and dynamically update when changing spoke patterns and other variables. I quickly added the ‘how to measure’ section to guide others for how to get the information the application required, and split into the ‘Basic’ and ‘Advanced’ versions, to try to hide some of the more intricate details when they weren’t needed. Animation was the next logical step, so that got thrown in later, and within the scale of a very sleepless weekend, I had something up that served my needs and then some. Please add comments here, post in the forums, or send an email to ehryk42@gmail.com about what you’d like to see next. There are bug report and feature request sections in the forum, which would be the best starting place. Help me build a great wheel building tool for the bicycle community!